Yep, this was my “birthday dinner”. Here’s the recipe for those who dare! The mango salsa is a great condiment. There is something about the sweet mango with the hot chilies and the fish that make this combination very special. It is a great balance. In an appropriate sized bowl, add the paprika, salt, garlic and onion powders, and freshly ground black pepper. In a coffee grinder, grind about four chilies. These do not have to be completely powdered; somewhat flaky is fine. Add the ground chilies to the mix. Next, in a small skillet, toast enough coriander seeds to make two teaspoons when ground. Grind the toasted seeds and add to the mix. Finally, partially grind the thyme and oregano leaves and, you guessed it, add them to the mix. Now give your grinder a break. Stir the spices and set them aside. Or, skip all this trouble (if you see it as such) and let Prudhomme do the work for you. Melt the butter and add the oil to it. Pour half of the spice mixture onto a plate. Dip a cold fillet into the butter and oil, letting some of the excess drip off. Place the fish into the spices and flip it to coat all sides. You might even toss the spices onto it. Just don’t get too much on the counter or floor. Set the seasoned fillet aside and repeat the dipping and dredging process with the rest of the fish. Meanwhile, a large cast iron pan should be heating up on the stove. 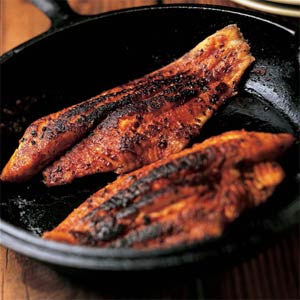 They say it can’t be to hot when it comes to making blackened fish. Make sure your range fan is on high and a window is open before you begin the cooking. Once the pan is hot, lay a few of the seasoned fillets into the pan. Cook each side until they look like, well, like the picture. If you think they are getting too black and yet are still somewhat raw, turn the heat down a bit or place them in the oven to finish. Don’t leave the other fillets uncooked! Cook those too in the same pan after the other ones are done! Okay. Serve em’ hot…with the mango salsa. You could wedge some limes too.